Saud Alsanousi is an award-winning Kuwaiti novelist and journalist, born in 1981. 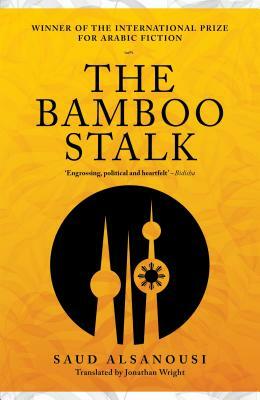 His debut novel The Bamboo Stalk won the International Prize for Arabic Fiction (IPAF). His work has appeared in a number of Kuwaiti publications, including Al-Watan newspaper and Al-Arabi, Al-Kuwait and Al-Abwab magazines and he currently writes for Al-Qabas newspaper. Jonathan Wright studied Arabic, Turkish, and Islamic civilization at St John’s College, Oxford. He joined Reuters news agency in 1980 as a correspondent, and has been based in the Middle East for most of the last three decades. He translated numerous novels from Arabic, including, most recently, Ahmed Saadawi’s award-winning novel Frankenstein in Baghdad. He won the 2016 Banipal Prize for Arabic Literary Translation for his translation of The Bamboo Stalk. Josephine escapes poverty by coming to Kuwait from the Philippines to work as a maid, where she meets Rashid, an idealistic only son with literary aspirations. Josephine, with all the wide-eyed naivety of youth, believes she has found true love. But when she becomes pregnant, and with the rumble of war growing ever louder, Rashid bows to family and social pressure, and sends her back home with her baby son, José. Brought up struggling with his dual identity, José clings to the hope of returning to his father’s country when he is eighteen. He is ill-prepared to plunge headfirst into a world where the fear of tyrants and dictators is nothing compared to the fear of ‘what will people say’. And with a Filipino face, a Kuwaiti passport, an Arab surname and a Christian first name, will his father’s country welcome him?, The Bamboo Stalk takes an unflinching look at the lives of foreign workers in Arab countries and deals with the problem of identity through the life of a young man of mixed race who returns to Kuwait, the ‘dream’ or ‘heaven’ which his mother had described to him since he was a child. Winner of the 2013 International Prize for Arabic Fiction (IPAF), the most prestigious and important literary prize in the Arab world. Its aim is to reward excellence in contemporary Arabic creative writing and to encourage the readership of high quality Arabic literature internationally through the translation and publication of winning and shortlisted novels in other major languages.